A native of Reston, Virginia, Ryan Mallard began his professional career in the mortgage banking industry in 1998 as a loan originator serving the Washington, DC metropolitan area. In 2005, his outstanding performance was rewarded by his promotion to the position of Branch Manager for Northern Virginia. He redirected his professional focus toward leadership and management opportunities, creating a large team of successful loan originators which continues to serve home buyers in the region with outstanding customer service. 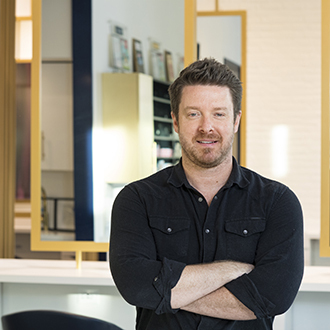 Ryan’s leadership capabilities and strong mentoring skills, along with his commitment to delivering the highest level of service, are some of the qualities that have proven most valuable in his current role as co-founder and Managing Director of Current Salon & Color Bar by Nese. Ryan’s successful business background, coupled with his wife Nese Altas’ award-winning hair stylist talents, afforded them the opportunity to accomplish her dream of one day opening her own salon. In May of 2012, Ryan and Nese combined their skills in a collaborative effort to open the doors of Current Salon to a warm and receptive community in Loudoun County. “It has been a fantastic collaboration,” says Ryan. “Nese is an amazingly creative stylist and enthusiastic mentor for our staff. And I enjoy the team management role of insuring the highest level of integrity and service to our clients while helping to make the salon an enjoyable workplace for each of our team members.” As co-owner and Managing Director, Ryan’s focus is on the management side of the business, which is a perfect complement to Nese’s strengths to ensure the overall success of the salon.